This entry was posted in Chickens, Feeding, Free range, Health, Housing, Q&A and tagged Breeds, chicken keeping, chickens, eggs, Poultry farming on June 26, 2013 by naturalpfg. 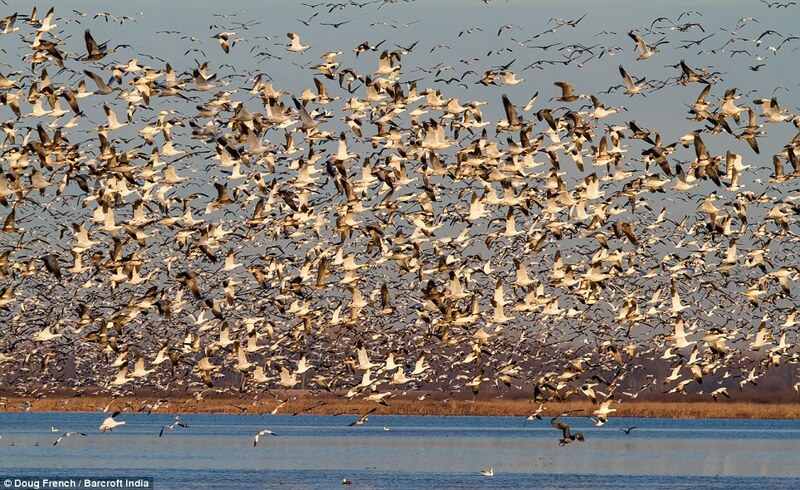 Scientists hope increasing hunting pressure will bring the expanding population of Ross’s geese under control and stop them from overgrazing and destroying their habitat in Arctic Canada. 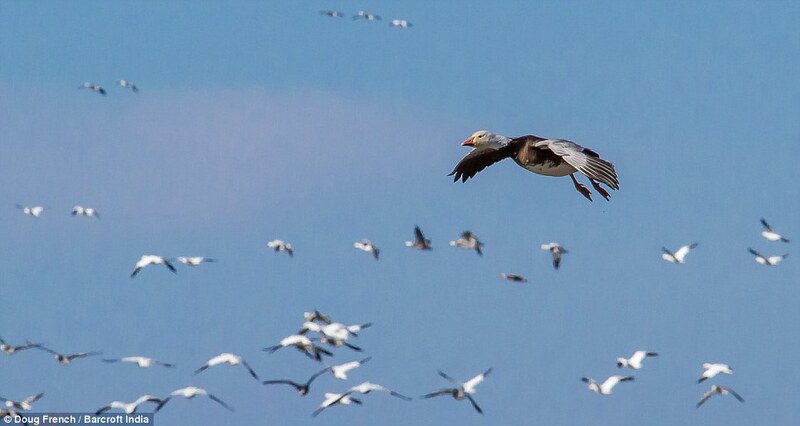 Wildlife scientists want Inuit hunters to kill more Arctic-nesting geese in an effort to manage populations so out of control the birds are destroying their own habitat. 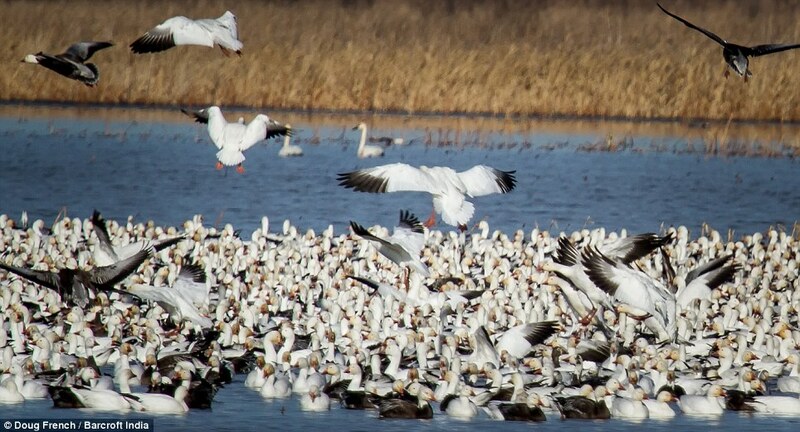 Experts acknowledge the plan isn’t likely to work and admit they don’t know what to do about ballooning numbers of Ross’s geese that are denuding large areas of the North. 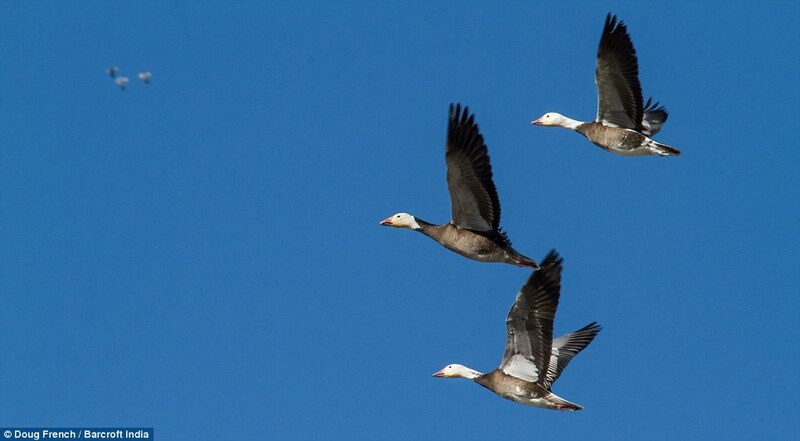 Ross’s geese — which migrate between Canada’s northern coastline and as far south as California — were once hunted so extensively that their numbers were down to a few thousand in the 1930s. 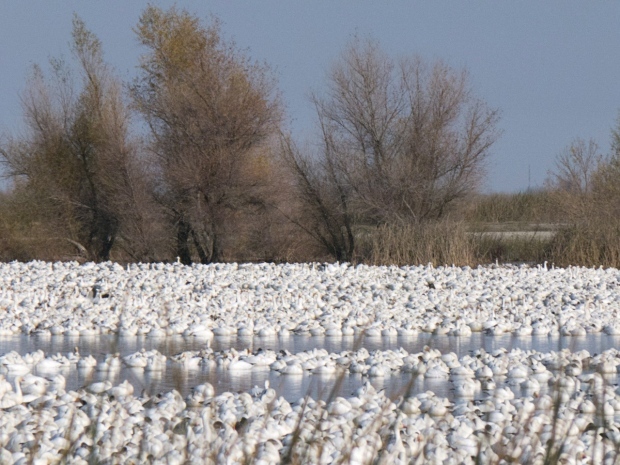 Environmental protections and the spread of agricultural practices that favour bird foraging have changed all that. 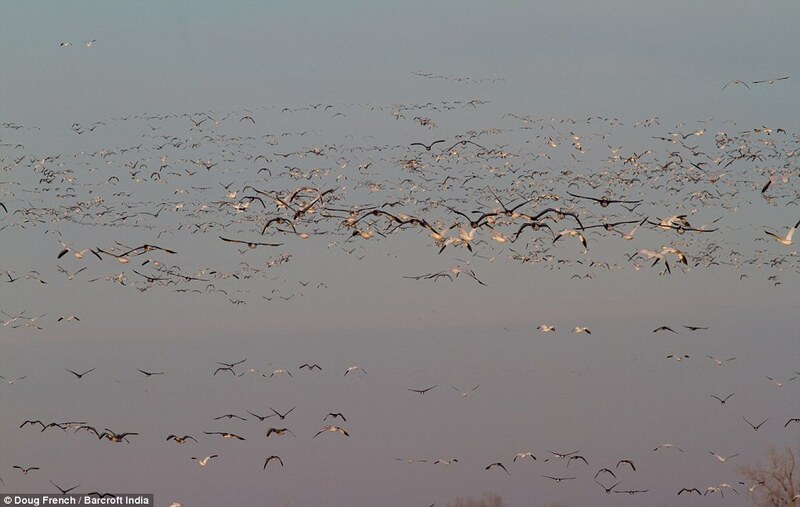 Kiel Drake of Bird Studies Canada estimates there are now about two million of the small, white geese. 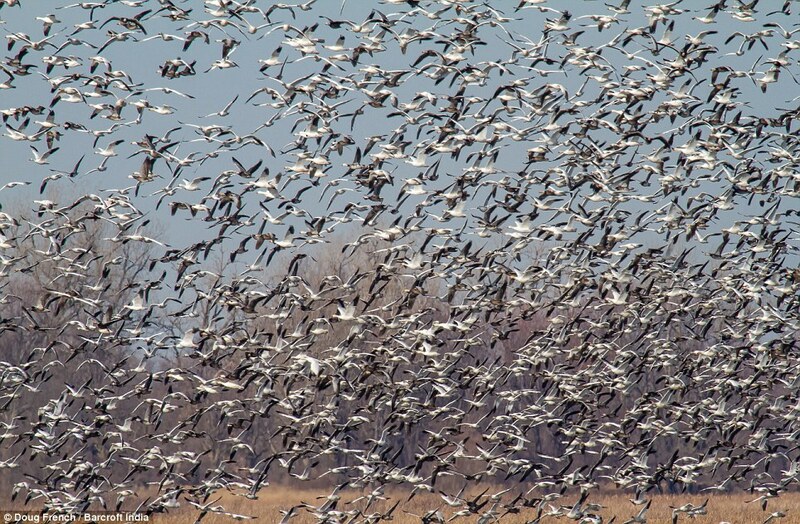 Together with about five million lesser snow geese — which have tripled their numbers since the 1970s and have similar habits — that spells big, honking trouble. 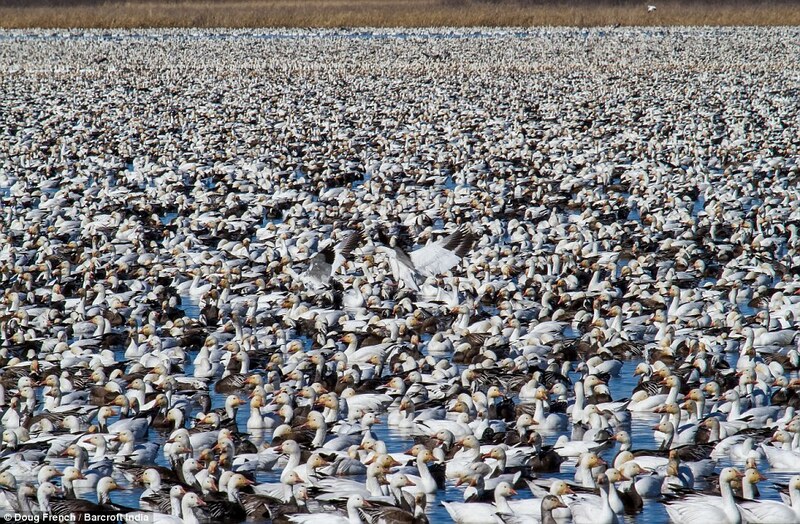 Sky-filling flocks are hammering their tundra nesting grounds in the Queen Maud Bird Sanctuary along the Northwest Passage. 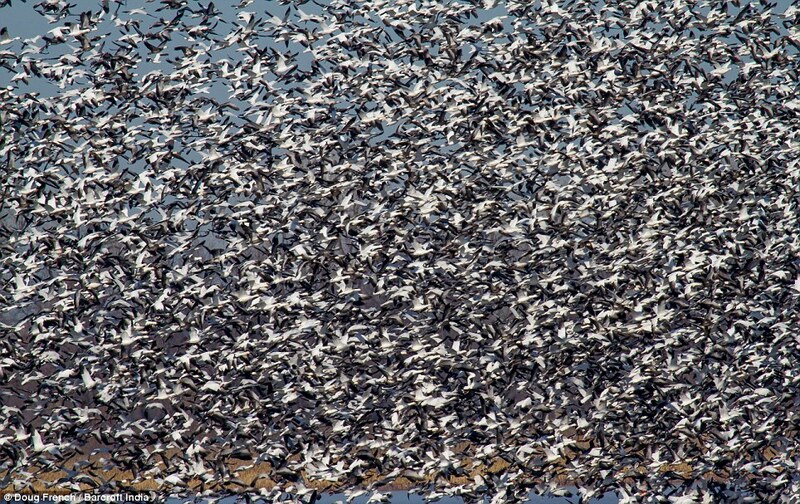 The destruction follows their migration path south, through the coastal marshes of Hudson Bay and James Bay. Grazing geese strip the land bare, exposing soil and peat. Recovery is slow in the Arctic’s cold climate and poor soil. Ripping out vegetation also changes the flow of soil moisture. It draws salts to the surface and prevents normal plants from growing back. That, in turn, affects other birds and animals. 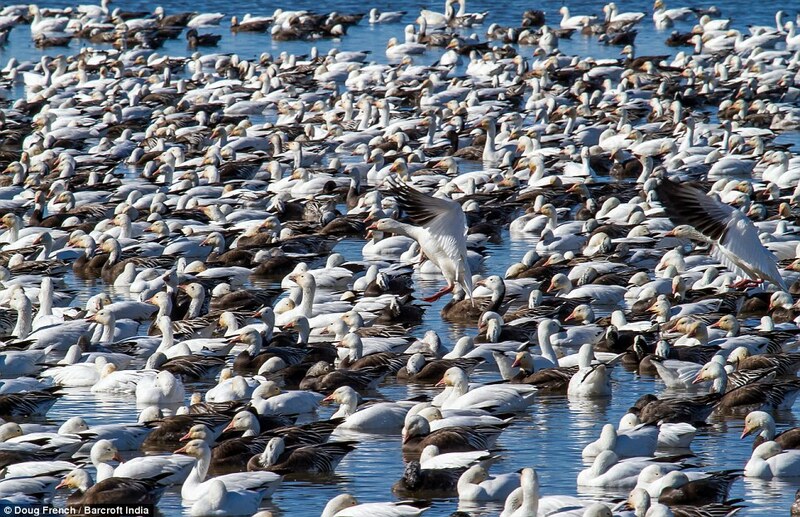 Last week, wildlife service officials asked the Nunavut Wildlife Management Board to agree to have Ross’s geese declared overabundant, which would allow managers to expand the hunting season. The board has made a recommendation to federal Environment Minister Peter Kent, who is to make the final decision. 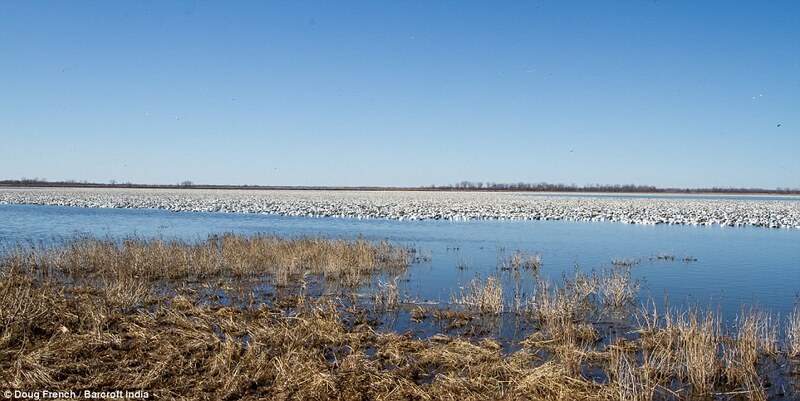 Snow geese were declared overabundant in 1999. 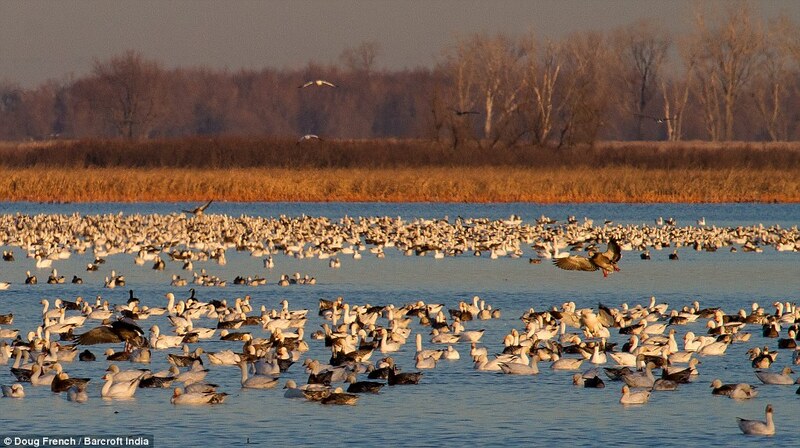 Hunters are allowed to shoot them spring through fall, but it hasn’t made much difference. Nor is Mother Nature likely to take a hand by reducing numbers through overcrowding and disease. 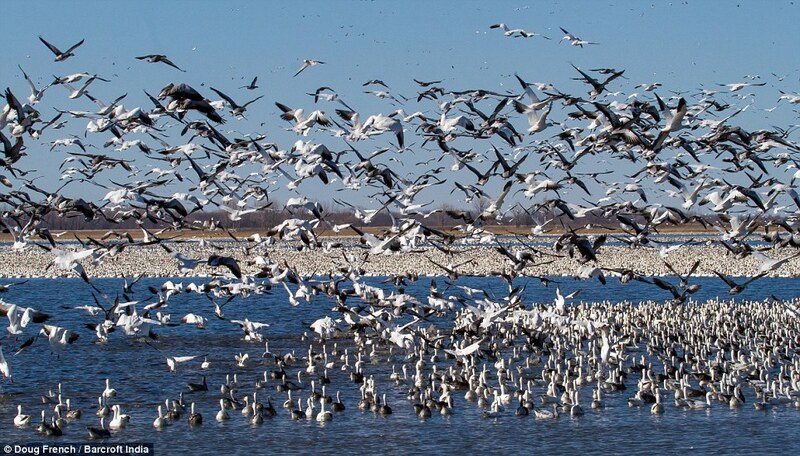 If their regular habitat becomes too degraded or crowded, the birds just find another area and strip it. 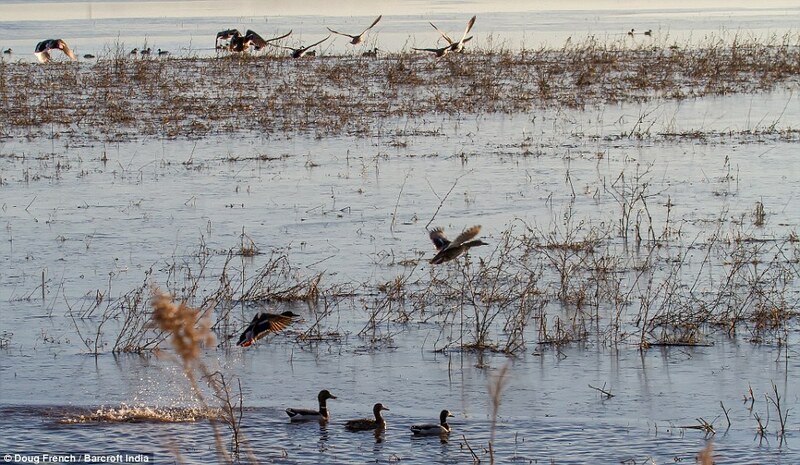 Others stay behind and eke out a living on their original feeding grounds, preventing recovery. “The problem expands as the population expands,” Leafloor said. No one really knows how much of the Arctic is already affected. And no one really knows where the problem is headed. “Nobody knows what the limits are,” said Leafloor. “We don’t know what the carrying capacity of the Arctic is. 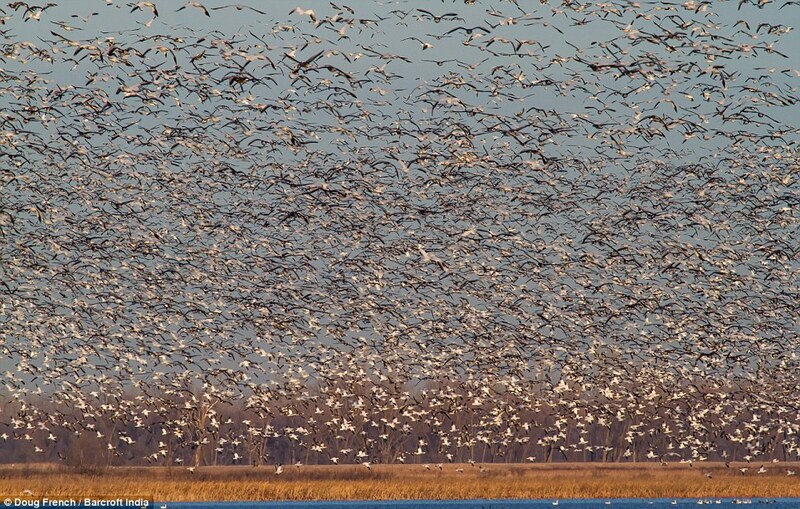 We don’t know how much food is there and how much natural habitat is available to support these geese. “What we’re doing right now is monitoring them and watching the changes in population size and documenting changes in their range. 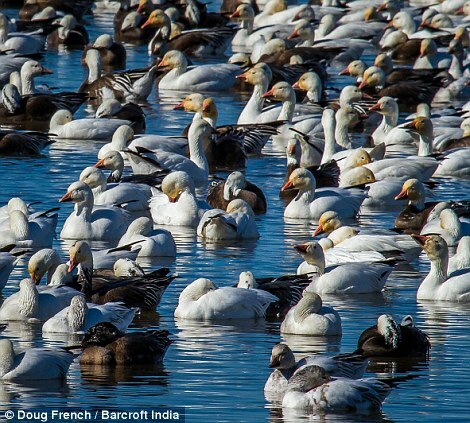 This entry was posted in Feeding, Free range, Geese, Health, Housing, News and tagged Arctic, Bird Studies Canada, Bob Weber, California, Canada, Canadian Wildlife Service, Hudson Bay, Northwest Passage on June 25, 2013 by naturalpfg. 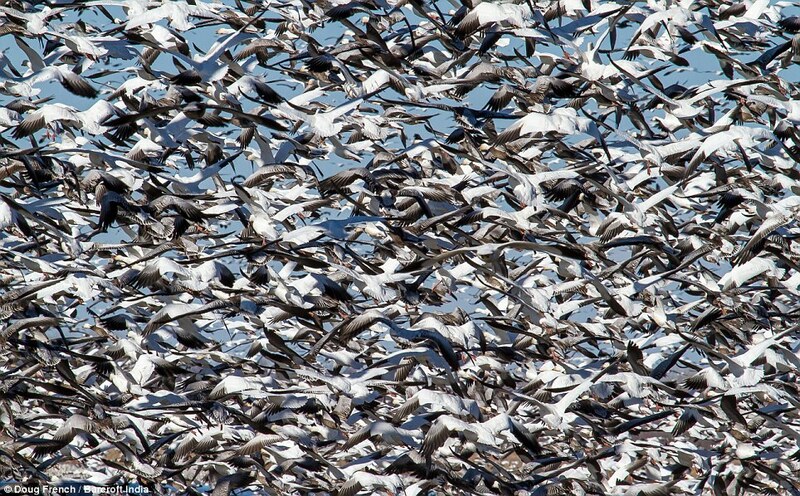 More than a million snow geese take flight over the skies of Missouri – creating the illusion of a blizzard – in these awe-inspiring pictures. 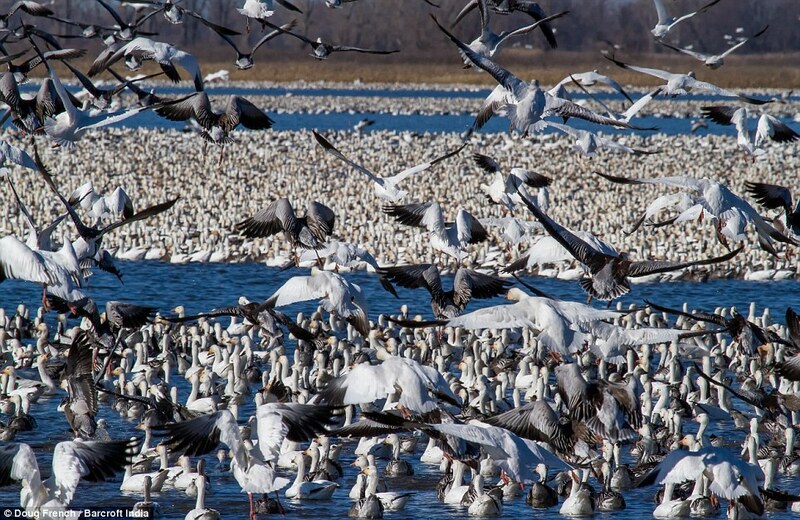 The spectacle was captured in Squaw Creek National Wildlife Refuge as the birds began their annual summer migration back to the Arctic tundra found in Greenland, Canada, and Alaska. 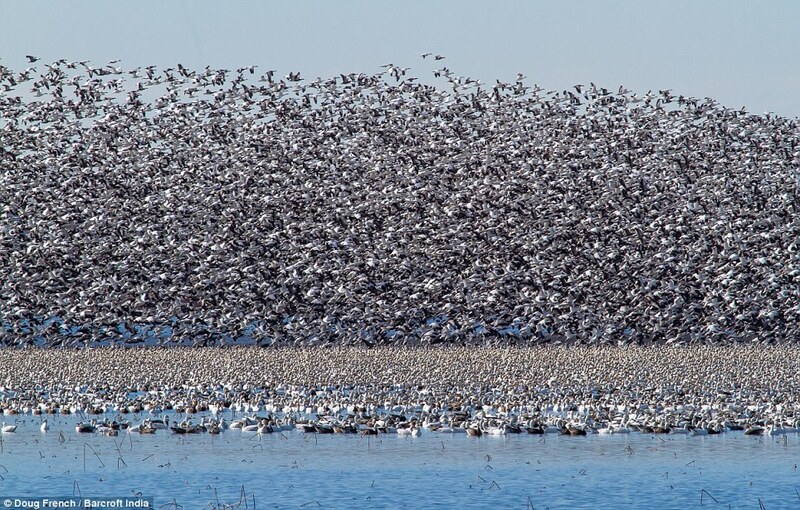 Groups of birds numbering between 100 and 1,000 make the journey together alongside others, their swooping mass blotting out large swathes of sky. The birds mate for life, usually in their second year, although breeding does not usually start until the third year. 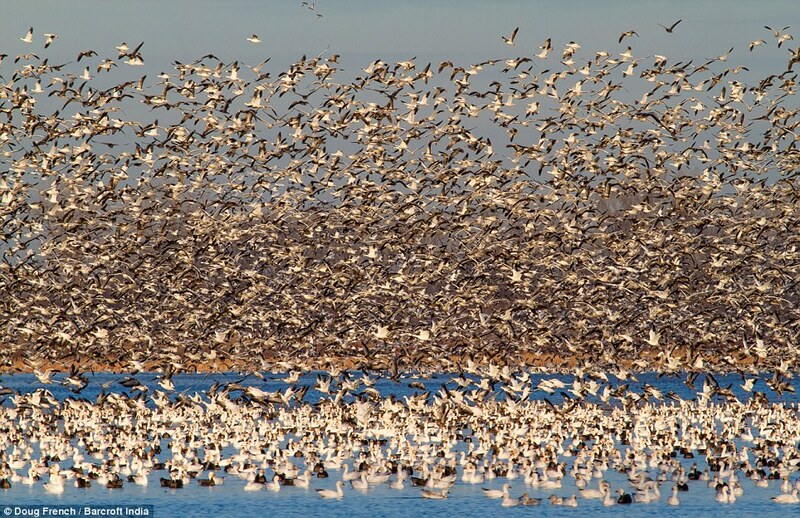 He added: ‘It is one of Mother Nature’s must see events.’ Snow geese breed north of the timberline in Greenland, Canada, Alaska, and the northeastern tip of Siberia, and winters in warm parts of North America from southwestern British Columbia through parts of the United States to Mexico. Occasionally some make their way to Europe. 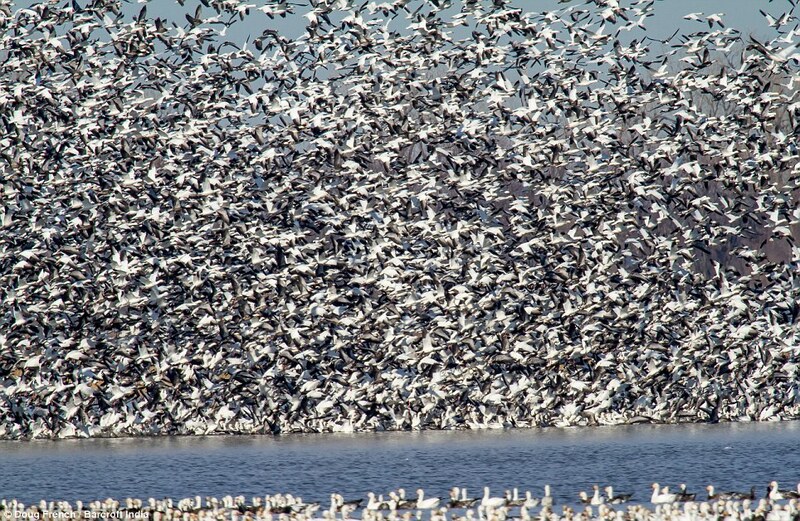 Snow Geese are visitors to the British Isles where they are seen regularly among flocks of Barnacle, Brent and Greenland white-fronted geese. There is also a feral population in Scotland. 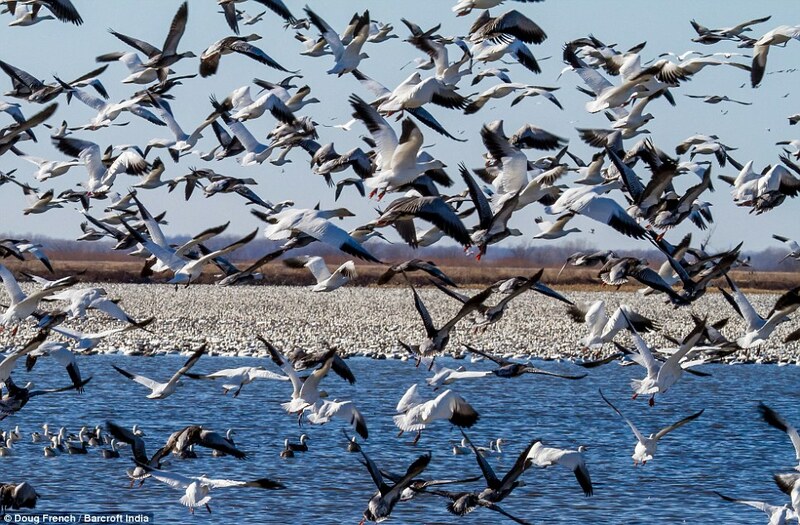 This entry was posted in Feeding, Free range, Geese, News and tagged Alaska, Canada, Central Flyway, Greenland, Missouri, Siberia, Snow Goose, Squaw Creek National Wildlife Refuge on June 25, 2013 by naturalpfg. A rescued goose has been named after Tamara Ecclestone in celebration of her marriage to Jay Rutland. The Formula One heiress received the special wedding gift from PETA after it saved the bird from a French foie gras farm that supplies Fortnum & Mason. The animal rights group moved the goose to a French animal sanctuary and named it Tamara in honour of the 28-year-old. Ecclestone has starred in a PETA advert against foie gras and personally convinced Formula One events to stop serving the controversial food product. Two male geese were also rescued at the same time as Tamara and were named Sir Roger – in honour of Sir Roger Moore, who narrated PETA’s video exposé of foie gras farms – and Prince Charles, in honour of the Prince of Wales, who refuses to serve foie gras at royal events. “Tamara has worked hard to save geese such as Sir Roger and Prince Charles from the cruelty of foie gras farms, and now the joy of her wedding will be shared with the joy of freedom that these geese now experience every day,” PETA Associate Director Mimi Bekhechi said. 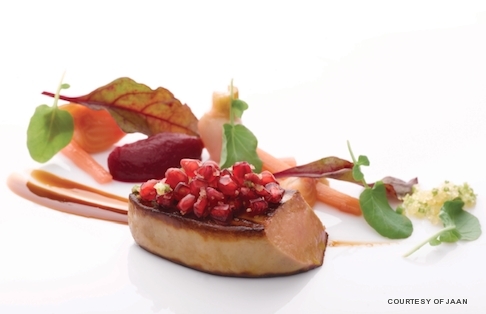 Celebrities including Twiggy, Ricky Gervais, Kate Winslet and Pamela Anderson have all taken a stand against the sale of foie gras, which is illegal to produce in the UK. This entry was posted in Feeding, Geese, News and tagged Charles Prince of Wales, Foie gras, Kate Winslet, Pamela Anderson, People for the Ethical Treatment of Animals, Ricky Gervais, Roger Moore, Tamara Ecclestone on June 19, 2013 by naturalpfg.